I can’t spend a day at work without coming across a blog or a Google Ad that promises you can be happier in a few simple steps. Happiness is being sought out on a daily basis. It is a goal that most of us create, because it is seemingly achievable, but also it is considered one of the absolute keys to a fulfilling life. Happiness for some is the love of family. Happiness for others may be spending a hard earned paycheck on a new high waisted bikini or monokini for an upcoming vacation. Regardless, happiness is something many of us are striving for. Little do we know, we can all becoming happier versions of ourselves in just a few simple steps. Life is hard. Really hard at times. It’s very easy to get upset at what’s been thrown your way and form an anger or resentment toward the world. Yet, by just a simple change in attitude, our entire perspective can be shaped differently. When you stop being angry, or giving attitude for all the things going wrong in your life, you start forming gratitude for all the things going right. It’s easy to get caught up in a wave of doubt and pity. Self-pity, especially, is like a snowball effect. But when you focus your energy on appreciating the little things in your life going right, that energy is almost like a breath of fresh air. Be grateful for the little things. The sunset which makes a gradient sky on your way home from work. The hour you get to spend watching your favorite TV show. Listening to you favorite song twice, back-to-back, simply because you can. Kindness is contagious. It really is. When you’re kind to someone, be it a stranger, a family member, a friend, an animal, you get a feeling of pride and happiness that you want to duplicate again in the future. Check out this heat map below. 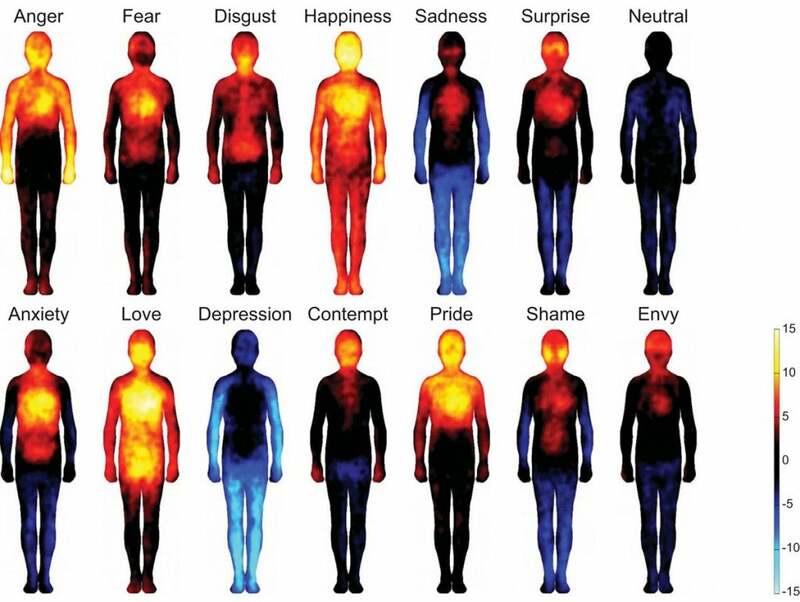 Researchers sampled a very diverse group of people and measured their heat composition upon feeling certain emotions. Check out pride, love, and happiness, it’s amazing! You can get these feelings by practicing kindness. Acts of kindness help shape your character as well which ultimately make you an overall better human being. Which for most people, when they know they’ve done a good deed, it makes them happy, building up their self-confidence as well. Do you know that feeling you get when you come home to a clean house, or you just got your nails done, or washed your car? It’s a feeling of pride which ultimately turns into happiness. Eliminating the clutter in your life and maintaining up-keep will overall make you a happier version of yourself. Do you have a closet that is full of random crap that you just haven’t had the time to go through? Well, guess what, what better time is now? By cleaning out our lives and ridding ourselves of clutter and useless junk, it creates less stress and anxiety patterns. Which brings us to…. It’s also very freeing to rid ourselves of the relationships that are keeping us down. Whether they are romantic, or friendships, by parting ways with people that bring more bad than good is an ultimate happiness inducer. It may be difficult, especially if you’ve formed attachment with people, but by cleaning out all the friends that are too selfish to worry about you, or the relationships that don’t make you a better person, in the end you are able to focus that energy on yourself. Very simply, if you can’t control it, don’t sweat it. There will always be things going on that you can’t control, and if those things are going wrong, then there really is nothing you can do, right? So why waste time and energy worrying? Like when you get a flat tire and you think, “if only I didn’t drive down that road, I never would have gotten this flat.” Wasting energy worrying about things that have happened already is exactly that, a waste. There will be plenty of things happening in your life that you can control and that you should focus on in order to change the outcome. But for the little things? Accept it and move on. Simple as that.